More than 10,000 customers lost power as a severe thunderstorm rolled through the area. Alliant Energy called in extra crews and prepared for “an all-nighter” after a storm left thousands without power in north Iowa after a severe thunderstorm. Justin Foss, an Alliant Energy spokesman, said they “hope to have all homes back on by tonight and early (Tuesday) morning." Alliant Energy is reminding people not to get near or drive over downed power lines. Watch: Drone footage captures storm damage in and around Clear Lake. You can follow updates on the outages from Alliant Energy here. Related: Images from the storm. 1:30 pm update: Alliant Energy says power will be restored to all but 100 customers by mid-afternoon Tuesday. The remaining should have power back by midnight. 11 a.m. update: As of 11 a.m., 691 Alliant Energy customers were still without power in north Iowa. 8:50 a.m. update: Alliant Energy said 828 customers are still without power in north Iowa. 6:25 a.m. update: According to its online outage map, Alliant Energy said 935 customers in north Iowa are still without power. 5:30 a.m. update: 1,023 customers are without power. 8:45 p.m. update: Alliant Energy is reporting 8,582 outages in north Iowa. 8 p.m. update: The number of outages has eclipsed 10,000, according to Alliant Energy. The number of reported outages reached 10, 615. 7:40 p.m. update: The outages have dropped to 8,885 in north Iowa. 7:20 p.m. update: The number of outages has risen to 9,474, according to the online outage map. 7 p.m. update: The number of Alliant energy customers in north Iowa without power is at 9,263, according to its online outage map. 6:45 p.m. update: The number of Alliant Energy customers without power is nearing 9,000. According to the outage map, 8,853 customers don't have power. 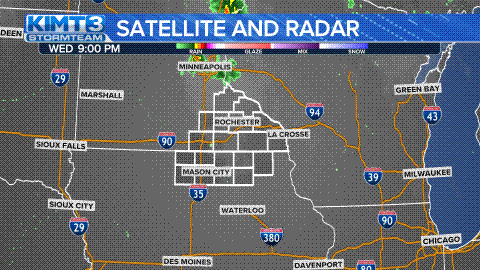 6:15 p.m. update: More than 8,000 people are without power as a severe thunderstorm rolls through north Iowa. According to the Alliant Energy outage map, 8,002 people are without power as outages affect people in Hancock, Cerro Gordo and Worth counties.